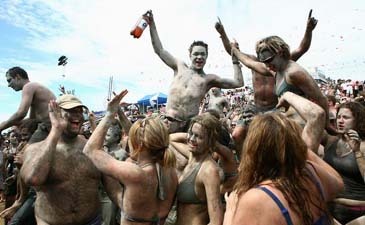 The tourists at the Boryeong mud festival on July 20, 2008. Predicted rain could not keep festival goers away at the start of this year's Boryeong Mud Festival on July, 2008. The 11th festival, which ran until July 20, 2008, is held annually on Daecheon Beach, one of the most popular beaches on the west coast of South Korea. Daecheon Beach is situated in the scenic Boryeong City in South Chungcheong Province, about three hours south of Seoul by bus. The festivities kicked off this year like any other: with bucketsful of mud. Young and old, residents and tourists alike made merry on the beach, some caked in full-body mud packs while others merely donned some blotches and smears. Most participants observed the tradition of drinking throughout the day — and carrying on after sundown. However, the festival's main attraction is mud and for nine days the public can freely enjoy Boryeong's famous mud — otherwise only accesible through cosmetics manufactured with it. The mud is dug up near Boryeong City, in the villiage of Gungpo, and very rich in minerals. Some scientists claim it possesses more Germanium and Bentonite than imported products and have lauded Boryeong mud's benefits. Apart from the variety of mud cosmetics on sale the festival also hosts numerous daily events like a soccer match and beauty contest. Muddy activities like skiing, slides and massages are free and for a small charge one can make use of a hand printing press or make soap and pottery. Entertainment includes a street parade and a live music stage and after-hours, when the final empty buckets have been collected for the night, the Mid Summer Night's Mud Concert and spectacular fireworks display keep the party going. In 2006, the festival attracted 1.5 million visitors and was first named Best Festival by the Ministry of Culture and Tourism who also designated it the 2008 Korea Festival. There are many places of accommodations to choose from along the waterway. Although hotels are generally not very English-friendly, the festival organizers compensate with brochures and available translators. It is one of the most relaxing weekends one can spend amongst the industirious people of Korea. For more information visit the festival's official website, www.mudfestival.or.kr or phone 011-438-4865 for translator information.